Wanting a new hunting or target round for your Smith & Wesson revolver? Magtech’s 500 S&W ammunition is an ideal choice for hunting, as a self-defense weapon against predatory animals, or for getting used to shooting this monstrous cartridge at the range. 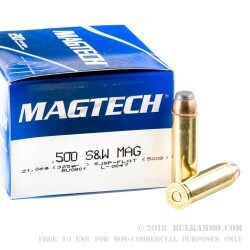 Each round of Magtech 500 S&W is loaded with a 325 grain semi jacketed soft point projectile, in a boxer-primed, noncorrosive reloadable brass case. 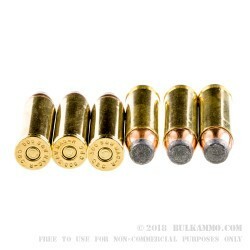 These rounds are capable of hurling lead at 1801 FPS and offer maximal weight retention, penetration and expansion. Made for taking down nearly any animal walking, the 500 S&W is the king of handgun cartridges. 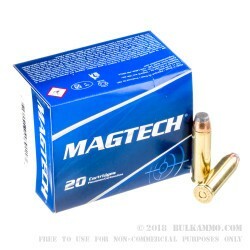 Each box of Magtech 500 S&W comes with 20 rounds. For nearly 100 years, Magtech has been a world leader in ammunition production. From their manufacturing plant in São Paulo Brazil, Magtech oversees every facet of their ammunition production, as they produce their own brass, primers and powders before loading their cartridges. This allows them to oversee every step of quality control. 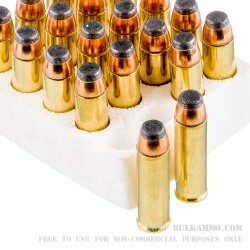 Therefore, they can put out some of the most consistent, quality ammunition available today.